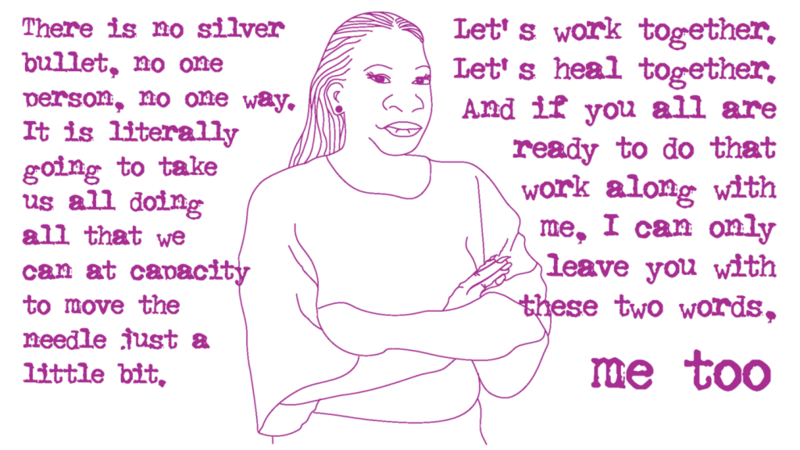 Civil rights activist Tarana Burke, founder of the Me Too movement, delivered a powerful speech to a packed house in Colton Chapel Sept. 5. Burke first used the phrase “me too” in 2006 as part of a grassroots campaign to support survivors of sexual violence. 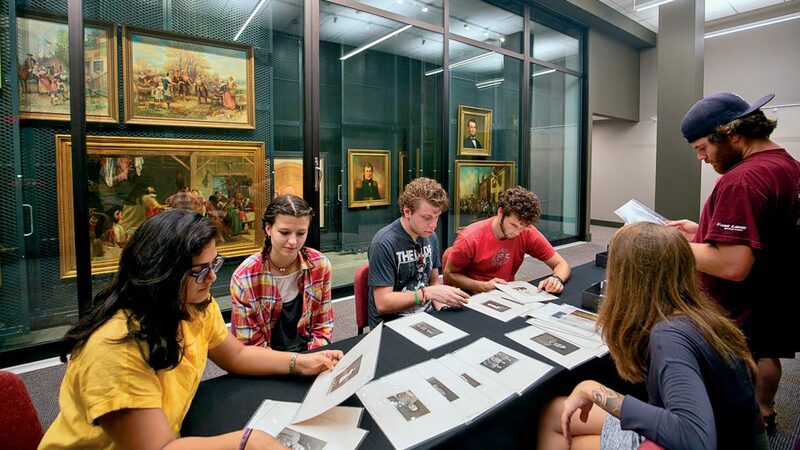 Thousands of paintings, sculptures, and photographs formerly kept in storage are now available for viewing at the Art Study Center. The climate-controlled secure space was created from the old black box theater at Williams Center for the Arts, which became surplus space when the College opened Weiss Theater in Buck Hall. Paintings previously hidden are on view via racks through a glass wall that separates the study room from the storage area. The recent exhibit Lafayette, Paoli, and the Revolutionary Spirit in Pardee Hall celebrated 250 years of Francophone/American friendships. The 17 panels of the exhibit were given by the Collectivity of Corsica and chronicle the life of Gen. Pasquale Paoli, an important figure from Corsica, a French-speaking island in the Mediterranean. Gilles Siméoni, president of Corsican Executive Council, Skyped with faculty and students during a reception in Pardee. The relationship between Corsica and Lafayette was forged by Ed Auble ’61, a two-time president of the Paoli Business and Professional Association in Paoli, Pa., the oldest establishment in America bearing the island hero’s name. 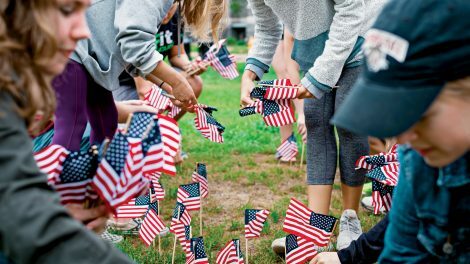 Members of the Democrat and Republican student groups planted flags on the Quad in memory of victims of the 9/11 terrorist attacks. Easton Mayor Sal Panto proclaimed Oct. 19 as Landis Day in honor of the College’s commitment to the community through research projects, engagement programs, and volunteer hours. 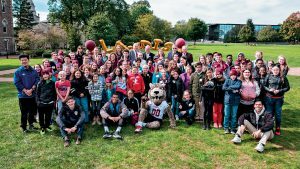 The day marked a merger between the College’s Landis Community Outreach Center and Center for Community Engagement (CCE). Historically, Landis was focused on developing active citizens and student leaders while CCE was focused on community-based learning and research. 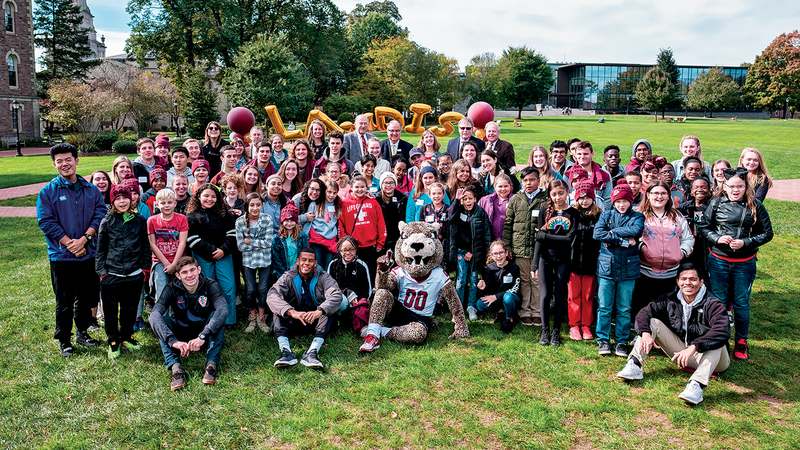 As part of a celebration on the Quad, fifth-graders from three Easton schools joined with Lafayette students to assemble care packages for mothers who are part of St. Luke’s Nurse Family Partnership. Panto, President Alison Byerly, Edwin Landis ’56, Pennsylvania State Rep. Robert Freeman, Easton Area School District Superintendent John Reinhart, and others addressed those gathered to celebrate. Elizabeth Lucy ’15 and Alex Barton ’18 (below) received prestigious Fulbright grants to teach English in India and Colombia, respectively. Lucy is a conversational English teacher working with grades six through 10 at Bethune Collegiate School in Kolkata, the first all-girls school in India. “What I’m focusing the most on is showcasing incredible women from all over the world” as a way to empower female students, says Lucy, an international affairs graduate. During a ceremony to commemorate the opening of the school in 1849, students put flowers on the grave of its founder, John Elliott Drinkwater Bethune. Lucy thought the day should be less about him and more about the importance of women’s education, so she organized a one-day seminar to address the oversight. Lucy also plans to teach photography to girls who have either experienced or witnessed sexual violence in their Kolkata community. 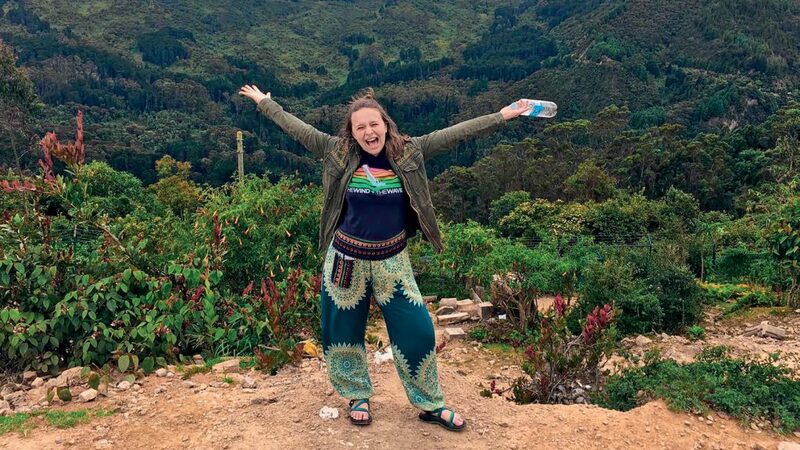 Barton, who double majored in anthropology & sociology and psychology, started teaching beginner English at Universidad Nacional de Colombia in Bogotá in August. In addition to creating lesson plans and holding workshops to augment online content, Barton, former president of Lafayette’s ultimate Frisbee club team, is working to expand access to the sport for young girls by organizing pickup games in area villages. She plans to pursue a Ph.D. in psychology or sociology or both once the yearlong Fulbright concludes. Classrooms are just one place where students learn. Operating rooms, construction sites, and marketing agencies also provide valuable learning environments, giving students the chance to gain firsthand work experience as they expand their horizons and prepare for the future. Gateway Career Center offers several programs that provide students these opportunities. One of them, InternShift, paired 42 students with alumni, parents, and friends of the College, who provided an immersive work experience where students contributed their talents and insights to high-impact projects. The InternShift program wouldn’t be possible without the support and generosity of alumni hosts, like Ken Londoner ’89, who founded it in 2015. 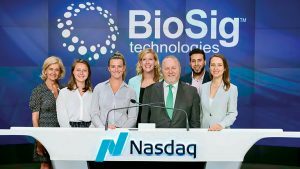 Londoner is founder and CEO of BioSig Technologies, a medical device company with offices in Connecticut, Minnesota, Texas, California, and Switzerland. This past summer, Londoner hosted interns Jacqueline Sophia Giovanelli ’20, Emma Bodner ’20, Antonio Exposito ’19, and Alaa Aga ’18. To date, Londoner has hired 18 Lafayette students for internships over the last four summers and created four full-time positions to hire Lafayette graduates. “InternShift stands above our collegiate peers as we leverage our alumni to create real educational opportunities, access to unique people, and projects of substance,” he says.